Hands Off Point Peron (HOPP) founder Dawn Jecks was joined by about 80 supporters. She said there was still a long way to go in the fight against the marina but the State Government and developer could be assured its opponents would not roll over easily. 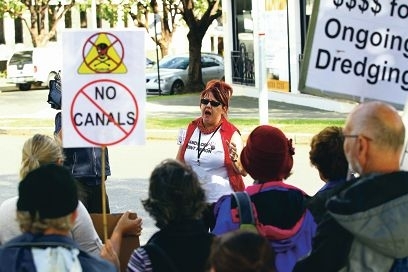 She would not rule out direct action, such as sit-ins, in coming weeks and months, and said people should not be fooled into thinking the EPA’s recommendation of conditional approval meant the marina and its canals would go ahead. ‘We’ve got the truth behind us, it’s a challenge to get it out there, but the truth will win out in the end,’ she said. Ms Jecks said the Public Environmental Review Process enabled developers to provide the EPA with a report that only addressed some environmental concerns, paid for by the proponent. Cedar Woods state manager Stuart Duplock said neither he nor a Cedar Woods representative addressed the rally but the company would continue to consult with HOPP supporters ‘through the normal channels’. After the West Perth rally, the group continued on to Parliament House where WA Greens MLC Lynn MacLaren accepted a petition with more than 8000 signatures against the proposal, for presentation to the Legislative Council.